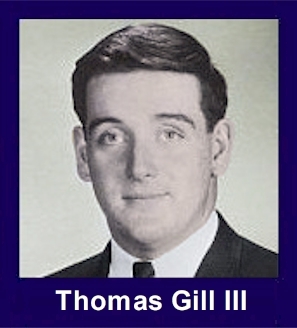 The 35th Infantry Regiment Association salutes our fallen brother, 1LT Thomas Patrick Gill III, who died in the service of his country on December 7th, 1969 in Pleiku Province, Vietnam. The cause of death was listed as Small Arms/AW. At the time of his death Thomas was 23 years of age. He was from Pawtucket, Rhode Island. Thomas is honored on the Vietnam Veterans Memorial at Panel 15W, Line 36. The decorations earned by 1LT Thomas Patrick Gill III include: the Combat Infantryman Badge, the Silver Star, the Soldiers Medal, the Purple Heart, the National Defense Service Medal, the Vietnam Service Medal, the Vietnam Campaign Medal and the Vietnam Cross of Gallantry with Palm Unit Citation. Thomas Gill was a fellow LT and my best friend in Vietnam. As I recall he had studied to be (or had already become) a lawyer and I believe he was from RI. We were both rifle platoon leaders in the same company. Our platoons operated together on occasion, but mostly separately. When operating separately we rendezvoused every three days to be resupplied. On December 7, 1969 while operating separately, an enemy soldier happened upon LT Gill's platoon position around nightfall. The enemy soldier was about 15 meters down a path from the platoon position when he made enough noise to be noticed. LT Gill bravely left the platoon position to investigate the noise. He surprised the lone soldier who by that time was hiding in the bushes. The startled enemy fired a burst from his AK47 and fled. Unfortunately one round hit Tom in the neck and killed him. I was on a firebase getting ready to return to my platoon (also operating separately - out on patrol) when the action occurred. I was flown immediately to the site where LT Gill was killed and was thus able to ascertain first-hand what occurred. Tom Gill was a fun-loving, pranksterish guy. Once when stationed on a large LZ/firebase (The Oasis), he convinced me to go in with him to throw a CS grenade into the hooch of one of our sister platoons. It was fun prank; we all got a "big laugh" and the sister platoon did get even with us later. LT Gill was a fearless leader who always exhibited a bravado that built confidence among his soldiers. We thought alike and dealt with many issues similarly. I miss Tom to this day. I served with Thomas at Fort Benning, GA, while we both attended the IOBC #6 class late 1968 thru early 1969. A great guy, good natured and always with a smile. What a tragic loss. I still think of him after all of these years. Rest in peace, and may God bless you and all of your loved ones.